Our retaining precast walls can have permanent colour added to the wet concrete during the manufacturing process, which will ensure that future painting will be unnecessary. You do have the option to have the fences stained or painted at a later date as a design feature. If your fence is looking dirty or drab, you can clean the fence to make it look new again. Over time dust and dirt can build up on the fences, and will need to be cleaned. Even though precast retaining walls are made to withstand the elements, it does not mean that over time they will not begin to show wear, especially if not sealed properly. Mould and mildew can grow over time, as unsealed walls absorb moisture. A good foam cleaner can be applied to the walls and left to dig deep into the surface. A power washer will do a really good job of cleaning the wall. We recommend a sealer is applied once the wall is properly dry to prevent any further moisture stains on the walls. Our walls are sealed as part of the manufacturing process to keep them looking good for many years, but scratches and chips can cause moisture to seep in. We recommend repair, or replacement of any sections damaged, as this will prevent deterioration of the walls. Sealing the walls properly is a high priority to extend the life of the walls. As our walls interlock, we can replace any damaged sections and ensure you have the best looking walls for many years. If you would like to discuss your wall requirement, or would like a free quotation, please do not hesitate to contact us. 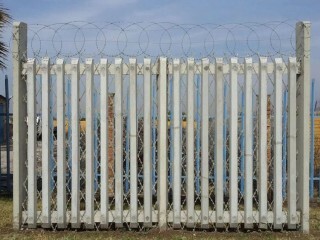 Country Wide Walling provide concrete palisade fencing that a modern touch to your home, without compromising security. Our concrete precast and concrete palisade fencing consists of professionally engineered, precision-manufactured, steel-reinforced modular concrete components that interlock during the installation process. During the manufacturing process permanent colour can be added to the wet concrete mix to assure that future painting will not be necessary.However, if desired, the fences can be stained or painted at a later date as a design feature. We provide our high quality fences and installation services to assure the efficient execution of your project. Exceeding your expectations is our chief goal. Our precast fencing system is used in a variety of projects to create a beautiful perimeter wall at a great price. More and more projects are replacing concrete blocks / bricks with our Precast concrete walling systems, and for good reason - it looks great, is priced right, and is essentially maintenance free. More importantly, our fences can be quickly repaired, without the need for heavy equipment and high labour bills, through our simple component replacement process. Our products are ideal for areas of high fire hazard and for those who wish to eliminate the annual and costly upkeep of traditional wood fencing. Because our products use integral colour, your fence will stay looking beautiful for years to come. That is why developers, large landowners, and HOAs are quickly adopting Custom Crete's products for their projects. It simply makes sense to use our precast concrete products for your next project, or to replace your deteriorating wooden fence.